Hello people. After i have saw one entity appeared in front of me while i was meditating i did some research about it. I am an atheist and i am very skeptic about things like that but this looked very real and it was crazy expirience.And it's weird that i am not only one that saw it. 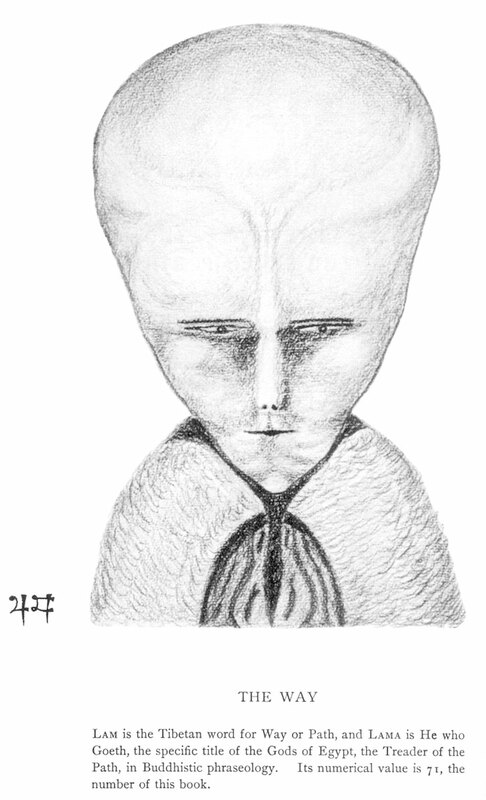 Then i saw that Aleister Crowley was first to contact similar being and he called it: Lam. 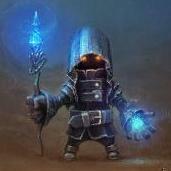 I was shocked because it is very similar with my entity and it had the same description of it. I never had knowledge about Crowleys stuff and i never saw Lam.After Crowley contacted Lam they made movie about greys aliens. Then i saw that Stan Lee had comic called The Watchers and it is same entity, he described that they are powerful beings who watching people on earth. I think you saw a Talosian. Does this photo trigger anything similar? Do you think that of the images you posted? An old crypto-hominid case in Brazil that fell through the cracks. She is quite possibly a hobbit. I told you before it's a "mind monkey" and a product of stress. Crowley was a dope fiend and under a lot of stress. Where did you find that pic? That's a disease which affects people in the jungle. It's fungal if I remember correctly. Why do you find only that image ugly? The ones you posted could be similarly perceived as ugly. Just an interesting observation is all. Does this disease cause a mane of hair down the back? Do you have a picture of the mane? 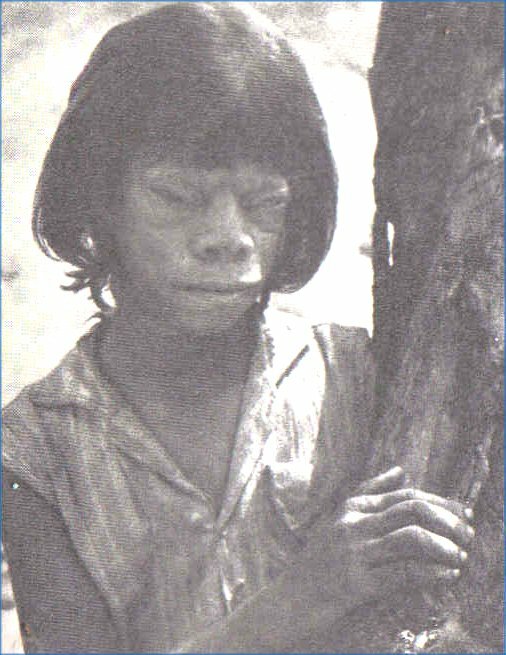 There are numerous chromosomal disorders among indigenous people (from inbreeding) which cause some weird things. My Kiimochknii (Skinwalker) "traits" are caused by one of these disorders. Man I've been trying research who that girl is but I can't find any info on her other than the name Maria de Jesus & a magazine she was featured in Mike Parker's The World's Most Fantastic Freaks in 1976. That's where I saw it. So she was Native. There is a chromosomal disorder among Native Americans. Because of it the person can be missing 6 to 35 genes. 27 missing genes is Williams Syndrome. They look like elves. She might be missing the full 30 or above. Or she could have the fungal disease whose effects look similar to that. Oh yeah. I had to look up Williams syndrome but yep that's exactly what it looks like to me. There is a chromosomal disorder among Native Americans. And what reason can be in your opinion among them? All Algonquians came from 7 people ( who possibly survived the Missoula Floods) on the Columbia Plateau. Inbreeding. Then after the "Great Dying" in 1675-1680. More inbreeding "nicked" it among the Eastern Algonquians. I'll do a full thread on her tomorrow. My best guess is that the original source is a Brazilian magazine from the 1970s, probably in Portuguese. ANYONE KNOW THE NAME OF THE MAGAZINE? 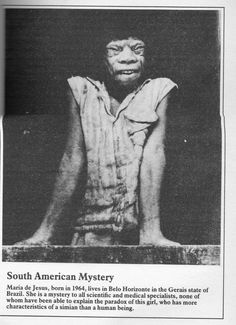 She was discovered in Brazil in Minas Gerais by an unnamed ethnologist (possibly Marcel Homet). It is unclear where she came from, but she was living with a woman who cared for her. She ate only raw meat and never learned to speak. She had a mane of hair down her back.She was photographed by journalists, and then examined by a local professor of pathology who said she was some kind of evolutionary regression. Then the American scientists came and took her away. Later the whole family disappeared. -Obviously she might have a disease. -Any real crypto-hominid from the homo line would look to us like they "had a disease". I think you are right about stress. But that image is always stuck in my head. Erase it. Stop thinking about it. It can't hurt you but thinking about it will make it haunt you. I dealt with one of those boogers after my stroke. People are not used to seeing significant irregularities.